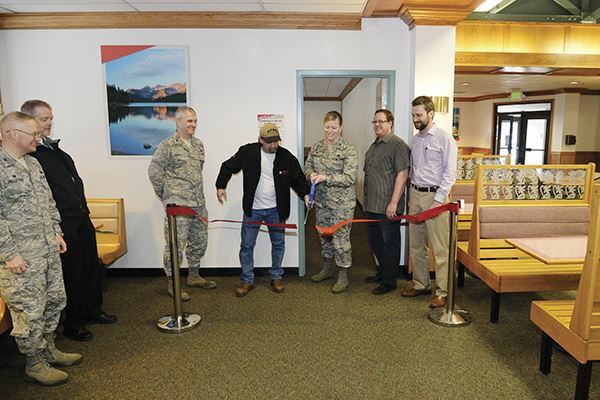 Base leaders cut the ribbon on renovations at the Skyward Café, Hill Air Force Base, Feb. 6. From the left are Col. Ley Havird, Ogden Air Logistics Complex vice commander; Monty Lewis, AFGE Local 1592 president; Col. Jennifer Hammerstedt, 75th Air Base Wing commander; Troy Greenhawt, The Landing manager; and Kent Wilcox, Lancer Hospitality Utah area manager. The renovation included replacing carpeting, repairing the bathroom, replacing televisions and creating a conference room. The conference room can host breakfast and lunch meetings and be reserved by emailing CKerbs@lancercatering.com or calling Craig Kerbs at 801-777-4165. Same day reservations can be made through the cashier.